Let’s talk about SPRING! It’s here, in good ole Texas. It’s here and it’s beautiful. The trees are budding, grass is starting to grow, and we’re certainly getting our fair share of rain. But on days like today, when the sun is shining bright, it makes me smile and remember all the things I love about Texas. So, the colors this week are yellow and blue. Yeah, I’m aware—yellow and blue make green. So throw a little green in there, too! These colors go so well together. Really, anytime you mix a primary color (yellow and blue are both primary) with one secondary color (green), it’s a good thing. 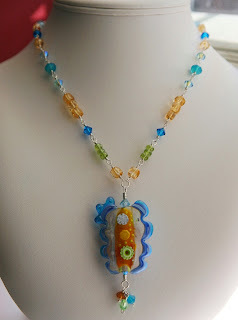 I particularly love this sky blue combined with the almost-golden glowing hue of citrine. And add some lovely green of that peridot, and this necklace has some major wow-factor! It’s absolutely one of my favorite necklaces. I wear it in the spring or summer, but I also wear it in the fall or winter when I’m tired of all the gray. 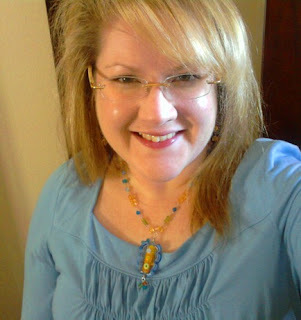 In fact, I wear this necklace with gray a lot, because it really pops against gray. It also pops against white, and even a lighter brown. Wear these colors with any neutral, and you won’t go wrong. But you can also wear these colors with each other, like you see in the photo—with a coordinating blue shirt… or a pale yellow shirt… or a peridot-green shirt. And remember, anytime you wear citrine (especially when combined with peridot)… you’re going to attract some (positive) attention! Peridot metaphysical properties: Peridot is a general healer. It’s also one of the most fortunate stones, indicating an in-flow of money, love, luck, and peace into your life. Use peridot to flood your mind, body, and spirit with a sense of peace and well-being. Citrine metaphysical properties: One of my favorites! This is such a lucky, attention-getting stone. Anytime you wear citrine, prepare to get some attention. It boosts self-esteem and protects against negative energy. It also promotes clarity. It brings light to the wearer and helps fight against depression.